What Are Aliens - UFO Sightings, Reports, Alien Abductions|Nazca Lines, Evidence of Ancient Aliens? The Nazca Lines are a series of ancient designs etched into a plateau in the Nazca Desert of Peru. The etchings extend about 50 miles, with some individual drawings measuring more than 600 feet across. Some of the drawings are of animals, birds and human beings, while others are simple lines and geometric shapes. 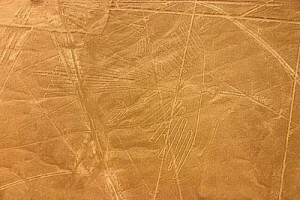 The Nazca Lines of Peru, along with the Nazca people and culture have been studied by Archaeologists, ethnologists and anthropologists for years. These professional researchers are not clear as to how these enormous drawings were created or what the purpose of the lines, geometric shapes, and figures seems to have been. 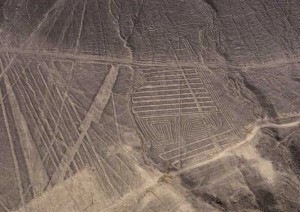 Research confirms that the lines were created by the Nazca people of the Nazca desert, who lived between 300 B.C. and 800 A.D., which was not a time known to be knowledgeable in aviation. Many of these humongous glyphs need to be viewed from above in order to really view the images in their entirety. This suggests that the beings responsible for these ancient lines may have had knowledge or access to air crafts. One theory of the Nazca Lines has been presented by Erich von Däniken, author of Chariot of the Gods. 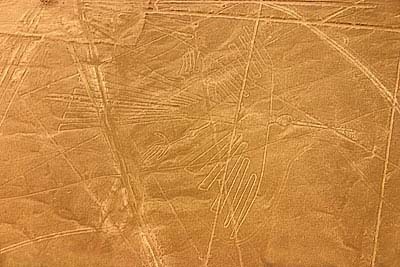 It is presented in the book that the Nazca Lines were created by the people who lived there in order to be seen by their Gods and to provide an airfield of runways to guide ancient alien space craftsas they come in for landing. Since this theory was published, many people have supported the idea because of the similarities between this supposed ancient airfield and one of modern day. It is theorized that ancient aliens were gravely interested in planet Earth’s minerals for the benefit of their own homeland’s atmosphere. 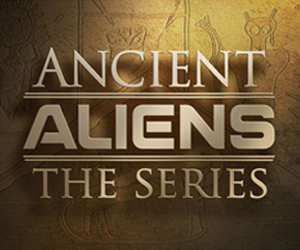 Ancient alien supporters believe that extraterrestrials were looking more specifically for gold. South American countries, such as Peru have been known for being rich in such minerals. It is unknown if extraterrestrials had the ability to detect a highly enriched geographic area before landing, however if these ancient astronauts were seeking a location to research planet Earth’s resources, South America would be a prime venue. Further evidence of ancient aliens in the Peruvian desert has also been found. Archaeologists have discovered perfectly modeled ancient plane artifacts of the Peruvian Inca people, suggesting that they had knowledge of such existing flying crafts in their area. how or why humans who wrote down their observations in their crude understanding of what they “obviously” were observing at the time..